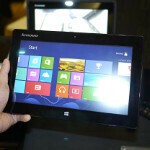 Never one to back down from saturating a specific form factor, Lenovo has simply been relentless with its Windows 8 offerings. From its ultrabook line to its unique hybrids, they’ve been relatively consistent when it comes to delivering multiple devices in a timely manner. Not too long ago, we reviewed both the Lenovo Lynx and ThinkPad Tablet 2, but now they have yet another Windows 8 tablet occupying its portfolio – the Lenovo Miix. Sticking with the same format to what we’ve seen mostly in the space, the Lenovo Miix is packing a 10.1-inch 1366 x 768 IPS display, which is identical in resolution to the previously two aforementioned tablets from Lenovo we’ve reviewed. Certainly nothing too special in this day and age, especially when it’s not even at 1080p resolution, the screen is still something pleasant enough to use on a day-to-day basis. Being a part of the IPSLCD variety, it has an overall neutral balance with its appearance, as its color production sticks to tones that aren’t too overpowering – while its brightness output is also adequate enough to highlight its visuals. In the end, though, it’s the same old panel we’ve seen in this particular space. Opting to go with a totally different design style, we’re actually digging the new direction that Lenovo is going with the Miix. It’s not boring like the Lynx, and at the same time, it doesn’t have that distinct enterprise-like design associated with the ThinkPad Tablet 2. Rather, the Miix employs a sleeker and cleaner design style that gives it a more modern appearance – up with the times is the better way of describing it. Sporting a soft touch matte finish, it manages to maintain a very clean appearance, while the tapered corners add a hint of aggressiveness to its overall design. The more we stare at it, we can’t help but think about the iPad 2/3/4 design. As a standalone tablet, you can pick up the Miix for $500, but if you’re already thinking about investing in that amount, you should basically fork over another $50 to snag the bundled keyboard dock. With it, you gain all the usefulness of a physical keyboard – making it even easier to type up long emails and documents. On top of that, it also functions as a case too, seeing that you can fold over the tablet while it’s in the keyboard dock. Let’s not get into detail with the interface, since as you know, all Windows 8 slates offer the same experience. And yet again, that’s exactly what we find here with the Windows 8 experience in the Lenovo Miix – so there isn’t anything different about it whatsoever versus others we’ve seen already. Running the show behind the scenes, its dual-core Intel Atom processor coupled with 2GB of RAM isn’t exactly imposing, but it’s still nevertheless effective enough to run most tasks without much fluff either. Sure, you might have to wait longer for a certain task to complete, versus other tablets with faster processors, but it’ll get the job done in the end – one way or another! Considering that the Microsoft Surface RT bolted out of the gate with a starting price point of $500, which didn’t include any of its optional Touch or Type keyboards, the $550 price of the Lenovo Miix with its keyboard seems like a better value – especially when you know you’re getting a full Windows 8 slate; not Windows RT. Indeed, it’s not the most cutting edge tablet in the space, but hey, if you’re about getting something that features a sleek design, affordable cost, and useful keyboard, this might seemingly fit the bill. If you stay in Modern/Metro, the Miix should work fine but if you spend time in the Desktop, I'd recommend spending the extra money for Lenovo's Thinkpad Tablet 2 - similar size, weight, and other specs but with a Wacom digitizer and stylus which gives you pointing accuracy for Office and other toolbars, handwriting recognition for an alternate input, and electronic ink to annotate Office and PDF documents or hand write Evernote or Onenote notes.